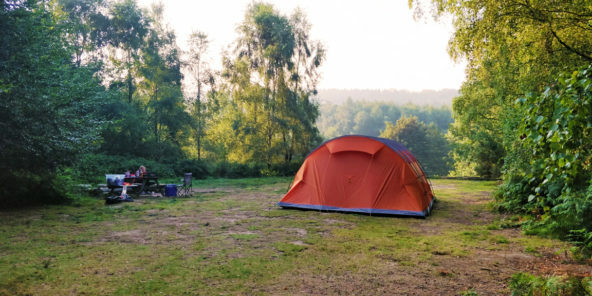 FAQs about camping in the woods at our campsite in West Sussex. Questions about camping in the woods? 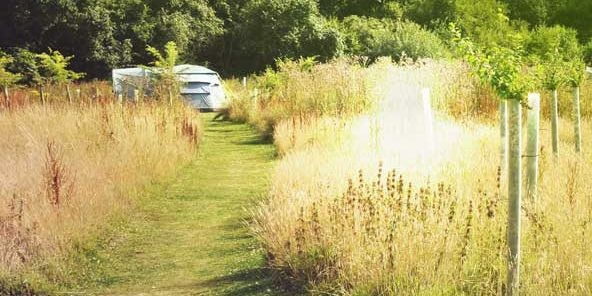 Here’s some of the most common questions we get asked about our unique take on camping in the woods at our West Sussex glamping site. If you can’t find the answer to your question here, please feel free to contact the office with anything we may have missed out. We provide a wood burning cooking stove with our ‘wild glamping’ bell tents. Each pitch has a fire pit, and we provide a grill to BBQ and cook on. A cool box is provided for each bell tent and we supply a couple of freeze ice blocks each day – but if you want to keep a lot of food and drink cold please bring additional cool boxes. Sometimes it’s a good idea to freeze your second day’s food so it keeps everything else cold as it thaws out. Local stores also sell ice if you need it. We do not allow radios, percussion instruments or any kind of amplified music. A quiet guitar and acoustic instruments are acceptable until our 10pm chill out time, when we ask you to keep the noise down and relax around your fire. Of course! Camping in the woods wouldn’t be camping without a campfire. If you’ve never built a fire before, try our guide, and for campfire cooking inspiration, see our recipes and ideas. We supply firewood locally sourced from sustainably managed woodland. No smoking is allowed inside the Bell Tents or within campsite facilities. However you are welcome to smoke around the campsite – please be careful to avoid the risk of fire in our woodland. We have a separate car park. Cars may not be driven to into the camping areas. We aim to provide camping in the woods not in a car park. Wheelbarrows are provided to move your equipment to the pitch (and the warden will assist if you need it). It may be a five-minute walk – but it’s worth it once you set up not to have cars in the campsite. Much safer for kids as well! The Secret Campsite Wild Boar Wood is approximately 45 miles from London which is roughly a one-and-a-half-hour drive via the A23 and M23. How do I reach Wild Boar Campsite? There are two great pubs close by and we are between them both: The Sloop and The Green Man. Both walking distance of about a mile and a half, or a short drive. Lots of other lovely pubs in villages within 5-15 mins drive. There is a small general store in Horsted Keynes (1.5 miles) and another in Scaynes Hill (2 .5 miles). There are a few more shops in Lindfield (3 miles) and supermarkets in Haywards Heath (5 miles). You should also try the local farm shops and markets that offer fresh local produce – see Markets. Arrival times for Bell Tents are between 3:00 pm and 8:00 pm. Please let us know if you expect to arrive late or are delayed. Are your bell tents considered 'glamping' or 'posh camping'? The Secret Campsite Wild Boar Wood offers ‘posh camping’ only. If you want to pitch your own tents, maybe you will be interested in visiting The Secret Campsite Beech Estate or The Secret Campsite Lewes. Well it wouldn’t be posh camping if we didn’t have flushing toilets! Our campsite has over twice the number of toilets recommended for campsites of this size! We have two of our unique, quirky, custom-built, private bucket showers made from reclaimed timber and locally grown larch. Set in the trees, they have aerial views of the surroundings, and are big enough to allow parents to shower with children. You just transfer a bucket of water into the shower bucket and hey presto it works just like at home. The showers get their hot water from our amazing custom-built wood-burning stove, water heated on your eco wood fire stove or campfire (or we do let you use the gas-fired hot water system too. See our Facilities – everything that makes an escapee’s life better. We are a woodland campsite! But we have lovely pubs and restaurants within walking distance of the campsite – see our Eat & Drink guide.